Drones, also known as unmanned aerial vehicles (UAVs), are rapidly becoming indispensable tools in a variety of industries. Although the drone industry in the U.S. is somewhat limited by the Federal Aviation Administration's slow pace in updating regulations, commercial growth of that industry grew from about $40 million in 2012 to more than $1 billion in 2017. A December 2017 McKinsey & Co. study predicted the UAV market would "have an annual impact...on the country's gross domestic product" of up to $46 billion. Safety features, reliability, control distance, and battery life also continue to improve. 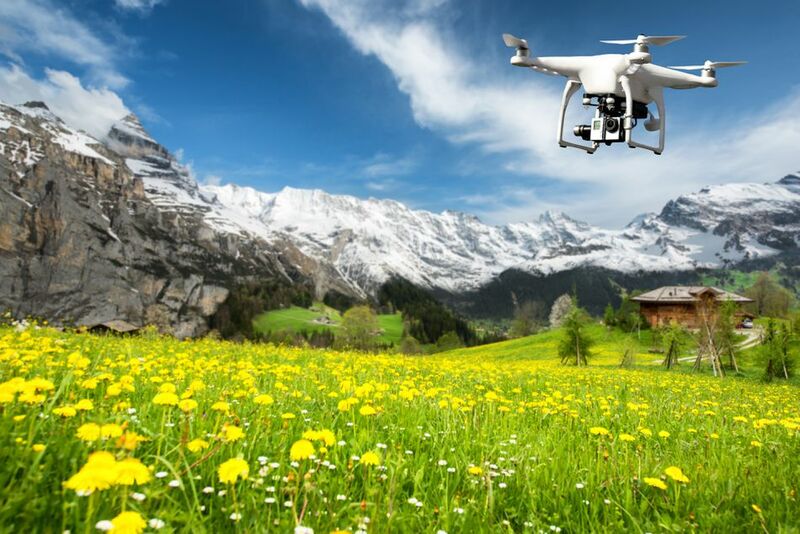 If you are technically inclined and looking to start a new business or have an existing business that could benefit from new technology, consider taking advantage of one of the latest trends and become a drone expert. Offering drone services on a contract basis could also be an ideal part-time or home-based business. Prior to the development of drones, taking photographs or video from the air required the (very expensive) rental of fixed-wing or helicopter aircraft. With the advent of low-cost drones equipped with high-resolution cameras, taking aerial images is now easily affordable for photographers. Images and video taken from the air offer a perspective that cannot be matched from the ground, and drones can safely operate at much lower altitudes and in more confined spaces than aircraft. Home and commercial security is another area rife with opportunity for a drone business. A drone can capture live video footage of a home intrusion and transmit it to a smartphone, as well as notify the police if required. Drones can also assist in detecting other threats to property such as fire and water leaks. Live video feeds from drones can be sent to a home or business owner's mobile device, to a central monitoring facility, or directly to emergency responders. Drones are becoming an indispensable tool in the arsenal of search-and-rescue organizations. Aside from the greatly reduced cost of using drones instead of helicopters for aerial searches, drones are able to fly at night and reach areas where helicopters are unable to travel. Equipping drones with infrared and/or night vision sensors allows search-and-rescue teams to detect missing individuals by heat emissions as well as visually, and drones can deliver emergency supplies as needed. Becoming a search-and-rescue drone operator or selling, renting, or equipping search-and-rescue drones has the potential to be highly lucrative while doing good deeds at the same time. Roof inspection by hand can be an involved, costly, and hazardous process, particularly on multistory structures. With drone technology, however, building inspections can be done safely and inexpensively, making this a great drone business idea. A drone can perform a close-up survey of the exterior of a building and deliver high-resolution video of the roof, gutters, chimneys, and building envelope, enabling a building owner to detect trouble spots in advance. If you have a background in construction or building inspection, a drone inspection service could be an ideal business or an add-on to your existing inspection services. In addition, drone crop surveys can be taken weekly, daily, or even hourly as required. Accurate information allows for optimal crop irrigation, fertilization, and pest control. Reducing water and pesticide usage and maximizing crop yields benefits the bottom line and the environment. Drone technology is by no means limited to unmanned aerial vehicles. Submersible drones have been available for decades, but up until recently were only affordable by large businesses or research institutions. Now underwater drones are available for less than $1,000, can be remotely controlled using a laptop or smartphone, and submerge to depths of up to 100 meters. Submersible drones can be equipped with lighting and take high-resolution underwater images or video at a fraction of the cost of contracting a professional diver. Land surveyors are increasingly turning to drones to acquire highly accurate digital survey data from the air in a fraction of the time (and expense) required by survey teams on the ground. If you are looking to start a business in land surveying or cartography, drone services could be an ideal way to get a jump on the competition. Drones are fragile devices that are prone to failure and damage, particularly if misused. And even though prices have declined significantly, most drones are still too expensive to simply throw away. If you are an expert with drones and are mechanically inclined with a knowledge of electronics, drone sales, repair, and customization could be a lucrative business for you. In addition, drones require knowledge and skills to operate them safely, creating a demand for experienced drone instructors. If you have the appropriate UAV skills, experience, and certifications, why not offer your services as a trainer? Drones can also be used to survey damaged areas for insurance claims. Whether operating a drone for hobby or commercial purposes, consider purchasing damage and liability insurance. While greatly decreasing in cost in recent years, a drone is still an expensive piece of equipment and can be lost or damaged through equipment failure, accident, or misuse. Damage insurance can cover the cost of repair or replacement. Drone usage also comes with potential liability issues. For example, if your drone runs out of battery power and crashes onto a vehicle or into a group of bystanders, you could be liable for property damage or injury. Make sure you investigate liability insurance if you intend to operate your drone in situations that could put people or property at risk. As of November 2018, the guidelines for owning and operating a commercial drone (called Part 107 or the small UAS rule) are fairly straightforward. First, you have to be at least 16 years old and pass a background check by the Transportation Safety Administration (TSA). You must be fluent in written and spoken English. Next, you have to pass the FAA’s aeronautical knowledge test, which you’ll take at an FAA-approved knowledge testing center. Before taking the test, familiarize yourself with drone regulations and restrictions, including emergency procedures. Once you pass, the FAA will email you a temporary license. Your permanent license will arrive in the mail in a few weeks. Remember that you can’t fly your commercial drone in certain places, and regulations govern its use. The more time spent on due diligence and advance preparation, the greater your odds of starting a successful business—and that applies to starting a drone business. Do some preliminary market research: survey businesses and potential clients in your locale that might benefit from drone services. Find out if there are any competitors. Is the target market already saturated? If it looks like there is a demand for drone services, write a business plan, even if you don't need debt financing for startup capital to get your business going. Checking the current regulations will be the first thing you want to do when you're thinking of starting a drone business. In the United States, the Federal Aviation Administration (FAA) established a set of guidelines and regulations in August 2016 to allow the use of drones for commercial purposes without the need for the operator to hold a pilot's license. Drones weighing between 0.55 and 55 pounds must be registered. Registration must be renewed every three years. Before every flight, the drone must undergo a preflight inspection to ensure it is airworthy. Drone operators must keep the drone in sight while flying. Commercial drones can only fly in the daytime, but twilight flying is allowed if the drone has anti-collision lights (drones used in search-and-rescue and other official public safety operations are usually exempt from the night-flying rule).